Welcome to Wharfedale Horse Box Hire. We specialise in equine transportation, and supply boxes for transporting your horses to or from the Wharfedale area and beyond..
Based in Guiseley, we are closely located for the market towns of Otley and Ilkley. 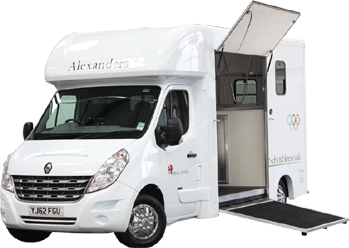 We are also close to Harrogate, Wetherby and Bramham, being approximately 35 mins away (at horsebox speeds). Our mission is to make the whole process of hiring a horse box simple and easy. Our horse box is state of the art, and brand new as of October 2012, it will cater for you and your horses in style, and includes comforts such as a reversing camera with internal screen and also video cameras in the stall area so you can check on the comfort of your horses whilst in transit.